A lavish coffee table book digs deep into architecture influenced by Buddhism. Kuala Lumpur, Malaysia -- FORGET the hustle and bustle of the modern world and prepare to be transported into serenity by Vikram Lall’s Architecture Of The Buddhist World: The Golden Lands. The first of six volumes on Buddhist architecture focuses on Buddhist temples and monuments in six South-East Asian countries – Cambodia, Indonesia, Laos, Myanmar, Thailand and Vietnam. When visiting Kuala Lumpur earlier this month to promote his book, Lall explains that he had excluded Malaysia simply because of the limited number of examples of such architecture here. In fact, Lall has excluded many other existing Buddhist monuments because the book is meant to serve as a synopsis rather than a exhaustive resource. “In Pagan (in Myanmar, often spelled "Bagan") itself, you have over 2,000 monuments in 100sqkm but I’ve only featured four of them. This selection has been done very carefully to create the narrative that I wanted,” explains Lall. And that narrative is about architecture not Buddhism. Through the book, Lall has attempted to encapsulate the ways in which architecture was “implied to manifest Buddhist thoughts and rituals in their diversity and complexity”. To put it simply, Buddhist architecture is different in different regions because Buddhism’s influences “coexisted and synthesised with local traditions” instead of “imposing its order” to transform existing architectural norms into something else that would have been alien to that part of the world. This explains the vast differences in Buddhist architecture in various regions (and the need for five more volumes!). Lall, 52, is based in New Delhi and is both a practising architect and an academic. He is the principal partner at Lall & Associates, a firm founded by his father, and he has taught architectural history, design theory and cultural studies for over 15 years. Oddly enough, Lall himself is not Buddhist. That is why he emphasises that The Buddhist World series is predominantly an architectural study. This, interestingly, contributes to global society in several ways. Aside from fully discussing the history and characteristics of Buddhist monuments in South-East Asia, most of the structures featured in The Golden Lands are accompanied by computer-generated illustrations. Using building information modelling (BIM) processes, Lall has fully and virtually reconstructed each monument in detail. This is extremely impressive, considering that BIM allows architects to create architectural models in multiple dimensions, including the traditional width, height and depth (for an accurate 3D perspective from every angle). This gives future scholars of Buddhist architecture a much more comprehensive understanding of these monuments. On top of documenting sound research on the history of Buddhist architecture, Lall’s studies may actually help global society when it comes to the conservation of these deteriorating monuments. 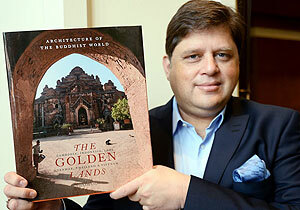 Similar to Lall’s multidisciplinary interests, The Golden Lands isn’t only targeted at architecture enthusiasts and history buffs. Photography lovers and casual readers may enjoy the large, full-page prints of these beautiful monuments. For the book, Lall worked with world-renowned and award-winning photographers like Marc Schlossman (based in London), Nicolas Cornet (based in Vietnam) and Jean Chung (based in South Korea). Even though they are all seasoned professionals, Lall had to brief them on the purpose of each photograph. “These are not ordinary photographs because I had to tell them the particular aspects I want to show,” points out Lall, using the ways in which light falls inside the buildings as an example. So it doesn’t matter if you are a professional architect or a practising Buddhist, Architecture Of The Buddhist World: The Golden Lands is a visual treat for everyone – it’s just a bonus that you’ll also learn some history.